Since its launch in 2005, www.yupoo.com has been dedicated to serving friends who love photography and share their lives. In 2008, the Yupoo.com provided a photo sharing platform and a photo storge platform for different needs. Up to now, we hope to bring some new changes: from November 28, 2018, we will stop provide signing up and uploading services , and enter the maintenance status. The photo storge website will fully activate the new url : http://x.yupoo.com, providing services such as pictures, videos, and wechat applets. Yupooers can continue to use until November 27, at the same time,We will provide a data backup tool as soon as possible. 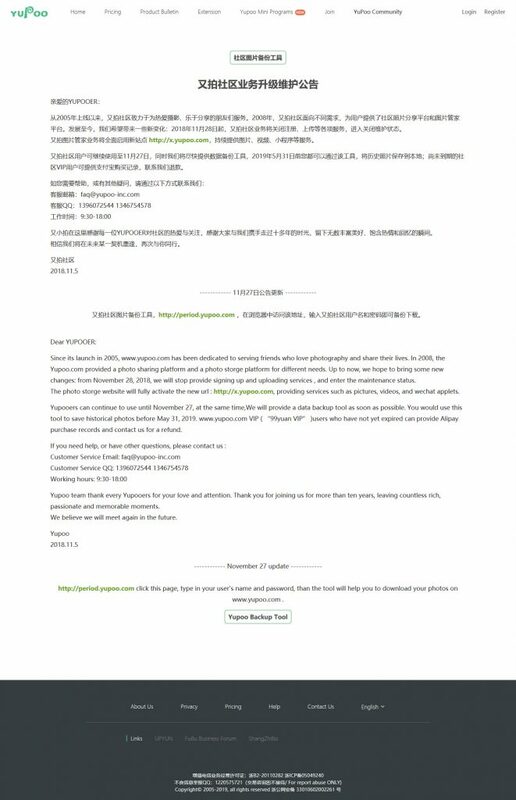 You would use this tool to save historical photos before May 31, 2019. www.yupoo.com VIP ( “99yuan VIP” )users who have not yet expired can provide Alipay purchase records and contact us for a refund. Yupoo team thank every Yupooers for your love and attention. Thank you for joining us for more than ten years, leaving countless rich, passionate and memorable moments. We believe we will meet again in the future. http://period.yupoo.com click this page, type in your user’s name and password, than the tool will help you to download your photos on www.yupoo.com .